The 3 Station Shower Trailer with Laundry Room | Oahu Series is a leading choice for site and project managers. This unit offers a compact, yet comfortable environment. Perfect for those who will be location for an extended period of time. An attractive, clean interior design is just the beginning for this trailer! 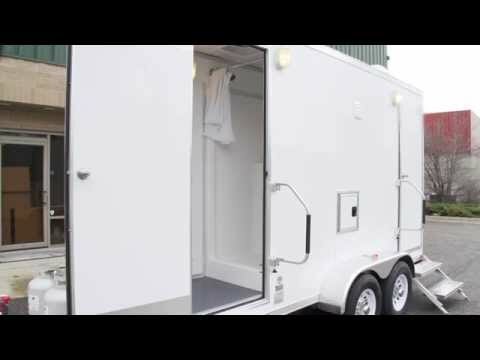 The shower trailer features 3-private shower suites with a bench for changing comfort. The unit also features a laundry room with a stackable washer and dryer. A liquid propane (LP) water heater is located in the unitlity room with a door, offering hot water for warm showers and hot water clothes washing. Dual propane tanks mounted on the tongue offer a self-contained water heating option. This shower trailer with laundry room also features a washdown package. The washdown package includes a reinforced marine-grade subfloor and rubber trim for easy clean-up. Delivered with a 13.5K BTU air conditioner and heat strips provide comfort in warm or cold weather.